Added on March 22, 2014 by Nathan Hoang. Ever since I saw this gif, I've been wanting to paint these guys. So I put on some TV shows in the background and began sketching them out. I was really pleased with how they turned out. They look so content. I changed them from looking up and to the left to up and to the right. It's a weird thing, I feel like when they look left, they're ignoring me and being stand off-ish, but when they're looking to the right and upward, they look optimistic. Maybe it's just how I sketched it in the notebook. Anyway, because of my time spent in advertising, I'm not content myself unless things come in at least sets of three, so I'm working on a couple more. 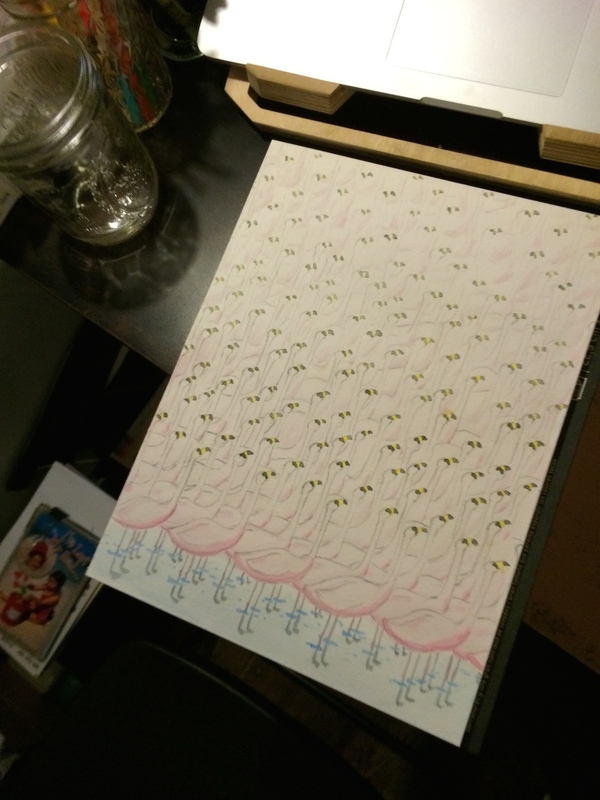 You can see the flamingos in paintings / otherthings, somewhere near the bottom.